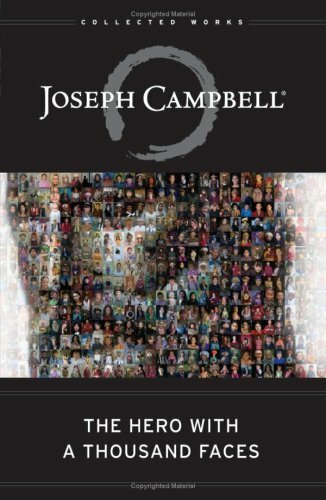 It is however, in Where the Two Came to Their Father, his first book (as co-author, Bollingen, 1943), now reissued as part of Princeton’s new “Mythos” series, that Campbell uncovered the subtler dynamics of the hero’s emergence in a balanced way. To demonstrate this still poorly understood pattern of ecologically sound ego-development, Campbell joined Maud Oakes and Navaho singer Jeff King in exploring the journey of “Twin Heroes,” who almost invariably are found at the very beginning, and thus at the very core, of the beautifully preserved and rendered in this seminal volume, records the ebb and flow of the two sides of the hero in interaction, displaying the dynamic interplay of inner energies that further an individual on the path toward an integrity of spirit. The republication of this book, which has been a collectors’ item, could make this psychology available to the general public, which remains in need of the insights contained here. The Bollingen Series, which was inaugurated to publish C.G. 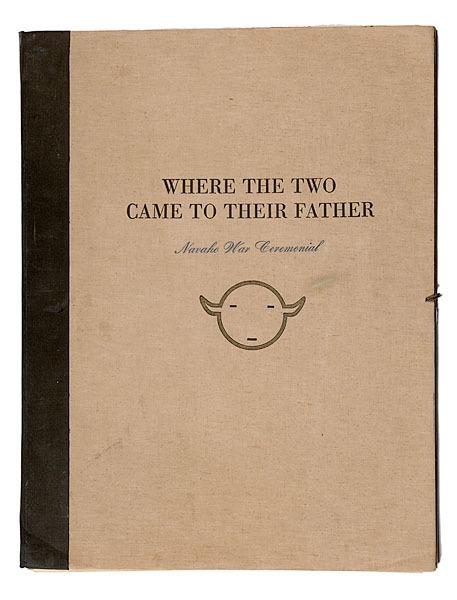 Jung in English, was launched in 1943 with the first publication of Where the Two Came to Their Father. Heinrich Zimmer, a mythologist from Heidelberg who had been the initial lecturer at the Eranos conferences, played a seminal role in launching the Bollingren series as well. It was he that suggested the series start with something on the American Indian. Zimmer felt that if the American reading public were first seduced by the rich and mysterious symbolism that originated in the own native land, their resistance to subsequent publications of more “esoteric” symbolism from Eastern cultures would be considerably attenuated. 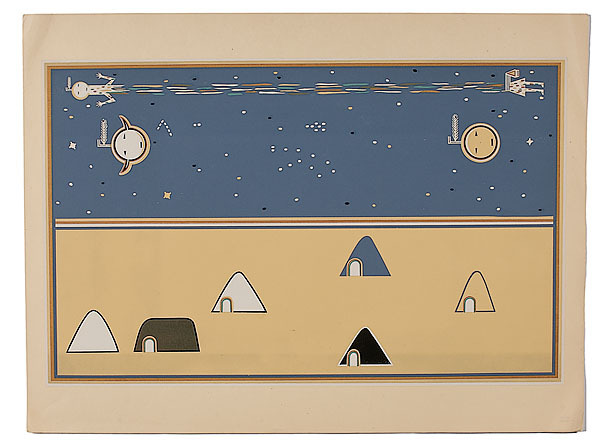 Navaho symbolism had been particularly appealing for Maud Oakes. A painter born in 1903, Oakes had grown up near Seattle, on an island whose many Indian mounds instill in her a consciousness of the Indian past. 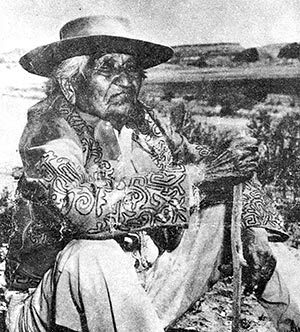 Jeff King (Haska-zilth-e-yah), one of the most respected medicine men on the Navajo Reservation in the first half of the 20th century. He served the U.S. Army as a scout and died in 1964. Living in a small hogan, working at her easel, she slowly gained the confidence of the Navaho medicine man, Jeff King. Through his mediation, the Navaho welcome Miss Oakes to witness and record their rituals, permitting her to make copes of sandpaintings they made on the earth with colored sand, powdered minerals, pollen and flowers. Then in his eighties, King directed Oakes, through an interpreter, to copy the sand paintings in crayon on brown wrapping paper. Together King and Oakes recorded the “Blessing Ceremony” which at that time was being performed over young men being inducted into the armed forces in preparation for U.S. involvement in World War II. It is one of the unusual and wonderful features of this book that it contains not only the central Navaho myth of “Where the Two came to Their Father,” but also an illustrative first-hand account of “Singer” Jeff King’s performance of the “Blessing Rite,” the ritual through which the myth is revivified. All too often we come away from reading the great mythologies of the world without a sense of how real and powerful a presence they exert within their native cultures; not here. Myth and ritual are neither ancient nor exotic; rather they form ideas and activities which are expressing what we already hold to be true and these are meant to be gestures which engage us every day, bringing our daily lives into accord with our “eternal truths.” The power of myth, as Joseph Campbell has said, persists “just beneath the crust of things,” wanting to be drawn through ritual into the conscious art of living. In the separability that is myth and ritual, myth is the breath, ritual is the breathing. The two myths preserved in this book dramatically illustrate the mythic ecology which structures the Navaho universe. Through symbolic association, Jeff King’s “Introductory Legend” and “Where the Two Came to Their Father” correlate all the worlds, colors, species, seasons, directions, mythic figures, plants and landscapes that shape the Navaho universe and its people. Established categories of separate identity, which in Western culture are so assiduously maintained, are overridden by the mythic web, which ensnares things, forces, places, and periods of history in stories designed to bring under control the otherwise chaotic and apparently accidental nature of the universe. It may be through this continual renewing of their ancestral order that the Navaho nation has managed to survive within a civilization that has been less than gracious towards it. Through ceremonials and rituals, they repeatedly realize an inner vision of stability and harmony that withstands in spite of the egregiously harsh realities their people endure.